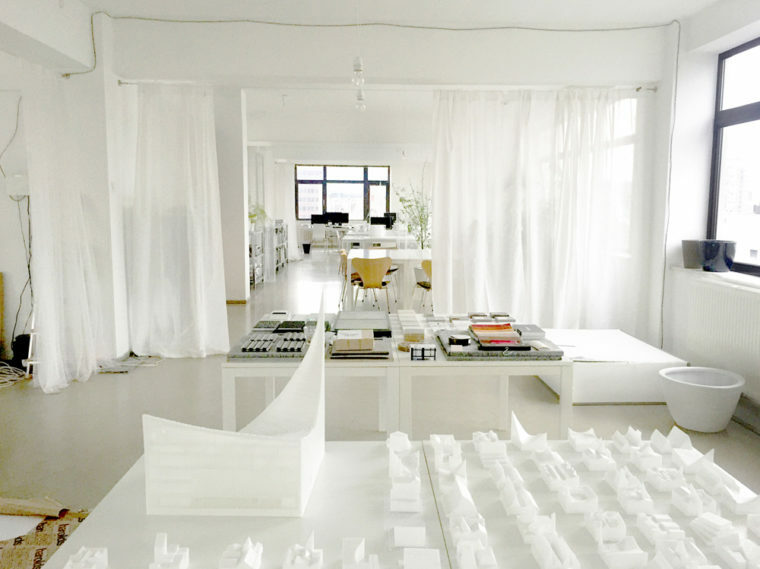 Over the past seven years, Studio Maks, the brainchild of prodigy architect Marieke Kums, has steadily grown into a multiple award-winning office for architecture, research and urban design. After working with OMA/Rem Koolhaas for two years, and with SANAA in Japan for four years, Kums returned home to Rotterdam in 2010 to establish her own practice. Brigitte O’Regan spoke to her. At SANAA Marieke Kums was responsible for major public buildings and master plans, dealing with everything from design to execution. Her projects there included the Vitra Furniture Building in Weil am Rhein, the Bawadi Masterplan for Dubai, and the Serpentine Pavilion in London. 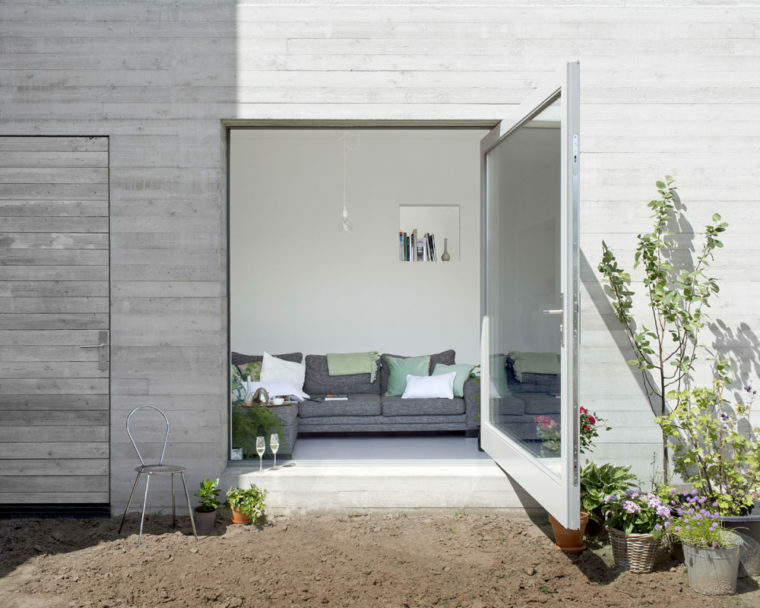 In the Netherlands, Kums’ commissions have expanded to include product, urban, landscape and housing design. Some well-known projects include the Deventer House, the Cloud Table in Milan, the renovation of the Chinese University Library in Hong Kong, Marres House for Contemporary Culture in Maastricht, and Learning by Nature, a tidal landscape design in Germany. On the 13 May this year, the Vijversburg Pavilion, co-designed with Junya Ishigami, opens in Tytsjerk. This is the first major public project won by Kums in the Netherlands. As such, it marks the end and the beginning of an era for Studio Maks, and the perfect moment to find out more about the works, ideas and vision of the woman behind it all. Marieke Kums’ rise to project architect at the ground-breaking Tokyo-based firm SANAA is the stuff of legend. Like OMA in Rotterdam, SANAA is famed for giving birth to the next generation of leaders in architecture. Other SANAA alumni include renowned architects Junya Ishigami and Florian Idenburg. After just two months interning at SANAA, in a rare act of early recognition, Kums was promoted to project architect. She dismisses this quick advance as a combination of luck and circumstance, citing her ability to speak German as the decisive factor. But it’s obvious there’s much more to it than that. When asked how she handled the intense pressures and long hours at SANAA and OMA, she points out that as a child she took part in sports at a highly competitive level. According to Kums, this prepared her to work well in teams. Kums confesses that even though she has always loved architecture, it wasn’t her first choice. Indeed, she ended up in the field by accident. She really wanted to become a doctor, but after three years waiting for her number to come up in the Dutch lottery system for a place in medicine, she threw in the towel and dived into architecture studies at TU Delft, and later at MIT in Boston. What she loves about the profession is the chance to combine a scientific way of working with a subjective and free way of thinking. In her typical style, in words, as in architecture, Kums is spot on. Her work is a potent mix of technical and programmatic precision and the freest, flowing play of space and experience. The combined effect invites unencumbered delight and spontaneity. Deventer House is a good example of this, with very little space available and a very low budget. Kums worked to create maximum space for the user at low cost. The sections and plans show clever storage solutions, graceful circulation and seamless, cost-efficient detailing. At the same time, the whole house exudes a sense of light and spaciousness. Spaces interact with one another to encourage encounters, and light falls in a sense of drama. Ordinary domestic scenes are framed to highlight their magic, their special presence, captured by the scenography of the house like cherished moments. It seems odd, and uncommon, to have something so functional and affordable yet so full of imagination. Similarly, the Cloud Table defies stereotypes. Like a river in a landscape, there are endless points of contact and experience. 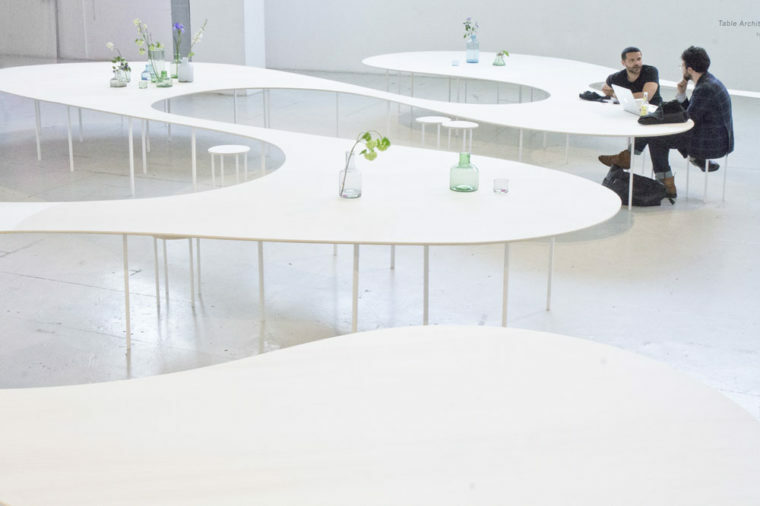 But contrary to our perception of organic forms, the Cloud Table perfectly meets programmatic demands and is executed with technical precision, where nothing is wasted. Despite early success and accolades, starting off a business in the Netherlands in the peak of the crisis years, amid widespread cuts in public spending, was not an easy task. Kums may have made some important connections worldwide, but at home she had to work on building up local recognition and a network. With SANAA, she had witnessed many international collaborations with locally based offices. The dignified and encouraging way SANAA worked with local offices brought Kums to believe it would be good for Studio Maks to work with the more established firm Junya Ishigami and associates on the Vijversburg Pavilion. This is part of the 2009 extension and renovation of Park Vijversburg, a historic thirty-hectare nature and culture park in Tytsjerk, just outside Leeuwarden. She invited Junya Ishigami to join the competition, and together they won. Because the project was part of the redevelopment of a very large area, involving many parties and including the restoration of Villa Vijversburg, Kums played an important role on the team by providing knowledge of master planning (unpractised by Japanese architects), along with local expertise. She designed the winding, landscape-like pavilion together with Junya Ishigami. This came naturally, as both enjoyed a similar design approach and understanding due to, as Kums puts it, ‘sharing the same parents’. Great beginnings aside, like all things in heaven and on earth, the project has encountered obstacles. At first the requirement was that they would work with just one contractor. 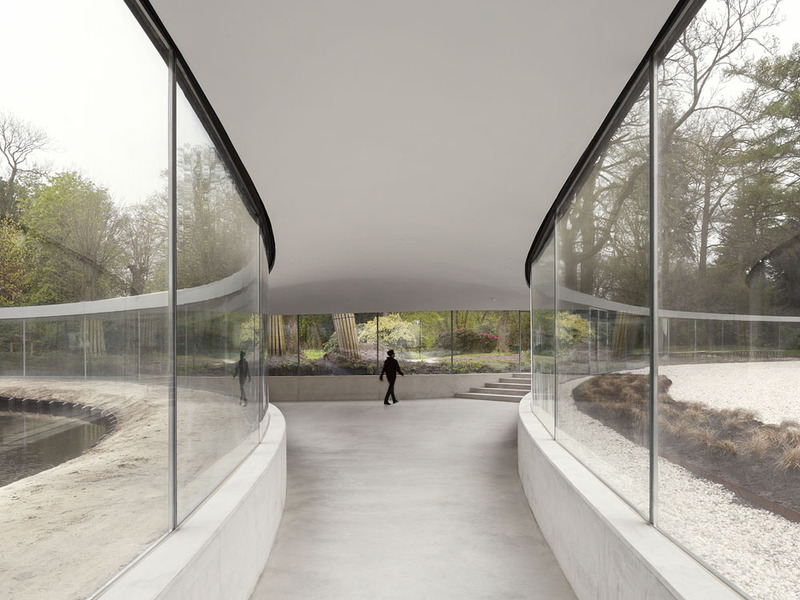 Because of the connection that the pavilion would make with Villa Vijversburg, a national heritage site, a contractor who usually works on restoration projects was chosen. At first glance, this seemed an excellent choice, not least because of the reputation for superior craftsmanship. Yet it turned out that the planning cultures for restoration and new buildings are vastly different. In the end, another contractor had to be brought in, which accelerated the building process exponentially. But even before that, heartbreakingly, another hurdle asserted itself. Junya Ishigami, in stark contrast to the harmonious collaborations Kums had experienced with SANAA, turned out to be a mercurial and difficult person to work with. From afar, he asserted absolute dominance and authorship over the project, but then refused to contribute, leaving Studio Maks alone for the past four years to see the project through. Now, upon completion, these obstacles are invisible. The Vijversburg Pavilion is a startling feat of boundless imagination and cutting-edge engineering. The minimalist, river-like roof, housing pools of conference rooms, and elegant corridors floats through the gracious 200-year-old park, supported entirely on transparent structural glass. When asked to describe the differences between Dutch and Japanese design, Kums uses the word ‘boundaries’. In terms of space and ideas, Kums describes the Dutch boundaries as hard. There is a rush for completion and closure. In Japan, by contrast, designers like to keep things as open as possible, for as long as possible. She has adopted this Japanese approach to her projects. ‘My intention is not to limit options for a space and the way it is used,’ explains Kums, ‘but to allow as much as possible to happen somehow.’ This way of working seems confusing at first. How, then, does the office win so many competitions? And how, if the design is kept open to possibilities for so long, does Kums inevitably produce such a complete feeling of simplicity? The trick with competitions, explains Kums, is to powerfully convey an idea, evoke the design, but not complete it. She dismisses the lean, elegant and efficient solutions she inevitably reaches in her finished projects as a matter of taste. ‘I like a well-organized space,’ she explains. Perhaps another trick to keeping the process and later use open, but clear, is the programmatic diagrams exploring relationships, which form the basis for Kums designs. This holds the principal idea together, like an underlying structure, but still allows for a myriad of contingencies to unfold during the design process and even in use after completion. Our attention swings to current and future projects. Studio Maks are now passionately involved in collective housing design for a location in Amsterdam. I’m curious how Kums will apply the sensitivity she expresses in villa design in collective housing. Her response again is direct. Like the Deventer House, she intends to create as much space as possible. The two and three-bedroom apartments will only be 60-70 m2 each, Kums explains, so people need to have maximum quality and efficiency in space. Her eyes then light up as we turn to her pet project right now, a series of books platforming young architecture practices. During her role as jury member for the Creative Industries Fund NL, Kums observed that there was so much exciting work happening right now in the Netherlands and Belgium, but too few platforms. This book series is an attempt to set that right. A standard format for the book is established, and selected candidates working in the two countries are invited to fill it in with imagery and information about their projects. Web platforms are too flat, explains Kums. It’s impossible to experience the depth of a project. This format leads to deeper contemplation and a more intimate encounter. The first edition, published by Ruby Press, will appear next September. In answer to what the future holds for Dutch architecture, Kums immediately replies that it’s an international scene. What unfolds in the Netherlands is now part of an international effort. But she has more to add. She recognizes the biases and stereotypes that hinder women in architecture because of everyone’s image of the architect as a male. Then there’s the social pressure to stop working full time if a woman wants a family. She misses women in the profession and believes there’s a lot to be gained from their participation. You don’t have to be a man to make architecture, Kums asserts. You don’t have to act like a man. Relationships within the building industry don’t even have to be the same. Of course, there are differences between men and women, but that just makes women’s contribution and participation even more interesting for the field. Right now, she says, there are very few women out there making their work happen. Women need to overcome the prejudice and pressure, not wait for opportunities to present themselves. Her advice to women in the field: have courage, be brave and seize the opportunity. Brigitte O’Regan is a student of architecture, urbanism and building science at TU Delft. This article is part of an initiative by TU Delft Feminists to document the work of inspiring women currently active in the field of architecture and urban design. Saturday 13 May the extention of Park Vijversburg officially opens. 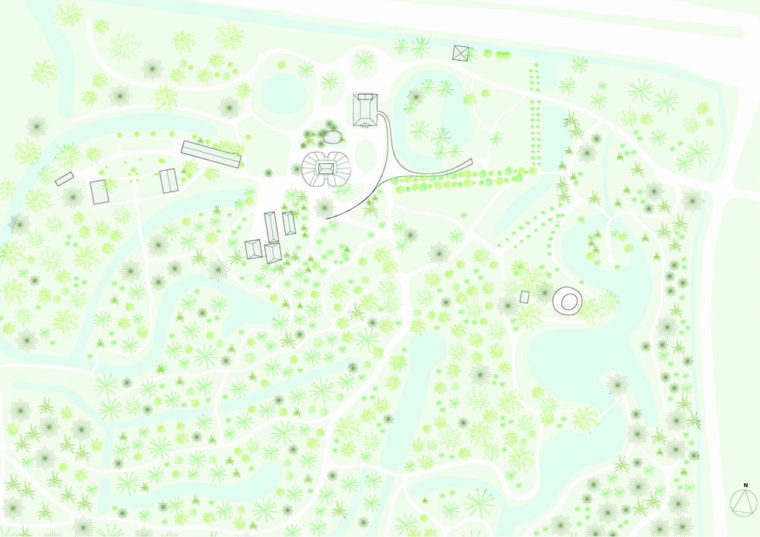 The designers involved are: Piet Oudolf, Lola Landscape, artist Tobias Rehberger and Studio Maks.